Periodontology is the treatment of gums and the bone which support teeth. 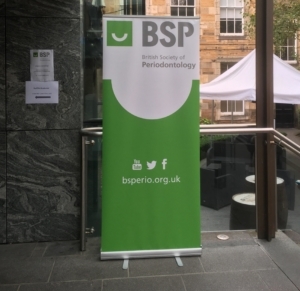 And this year the British Society of Periodontology met in Edinburgh to look at all the lastest thinking around this subject. We heard about probable links between obesity and gum disease, as well as the likelihood of vitamins C and D making a difference to gum and bone growth. It seems studies are difficult to fund and execute to prove these links, but that the theory is generally recognised as making sense. Since I was trained the understanding of gum disease has changed. It used to be thought it was largely down to the presence of bacteria, but has now been shown to be largely due to a person’s immune response to plaque. Some people’s excessive immune responses ruin their gums. In many ways however the same message and initial treatment applies- get rid of the plaque! We can help you control this, but brushing teeth twice a day and interdental cleaning will always be the best place to start caring for your oral health. Day 2 of the conference looked firstly at bone loss around implants and how to manage this. There are still different theories around this subject and we will keep reviewing our practice in light of the latest understanding around maintaining implants. The second half of this day was on soft tissue- or gum aesthetics around implants. This is vital to ensure your restored implant looks natural. The best practitioners at this are unfortunately not in the UK. I have previously been taught by professors from Europe on this and to hear from another was again inspiring. If you have any questions about your gums please come and ask us- whether your worries are about health or an aesthetics. There are things we can do to improve your oral health massively, even if we don’t have all the answers yet! Get a consultation arranged by registering below. We’ll get in touch and arrange an appointment.